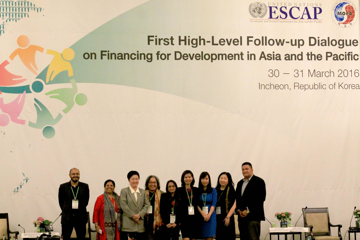 The United Nations Economic and Social Commission for Asia and the Pacific (UN ESCAP) held the First High-Level Follow-up Dialogue on Financing for Development in Asia Pacific on March 30-31, 2016 in Incheon, South Korea. More than a hundred participants attended the event, including nine (9) representatives from civil society organizations. The event was organized to provide different development actors a venue to review the Addis Ababa Action Agenda (AAAA) commitments and discuss strategies for their implementation. The High-Level Follow-up focused on six key issues: regional tax cooperation, capital markets, institutional investors, financial inclusion, climate finance, and South-South cooperation and triangular development cooperation. Space for civil society participation was tokenistic at best, with CSO delegates limited to short interventions, and not provided speaking slots in the panel sessions. The dialogue highlighted technical aspects of taxation/gathering revenue from various sectors, trade, technology use, reducing illicit financial flows, and development cooperation but most panelists did not discuss how these affect the grassroots communities, especially the vulnerable and marginalized sectors. CSO delegates brought into the table the issue of shrinking space for civil society organizations due to restrictive laws implemented by various governments in the region, making it a struggle for many CSOs to exercise their right as development actors. Another issue is how several large-scale infrastructure projects have adversely affected grassroots communities. Military instruments have been utilized in land grabs, forced evictions, and other human rights violations. Some projects also have caused severe and irreparable damage to the environment. The most vulnerable to these are the marginalized sectors: the women, children, indigenous peoples/cultural minorities, farmers and fisherfolk, the urban poor, among others. In the issue of regional tax cooperation, CSOs emphasized the need for transparency and allocation for services for the people. 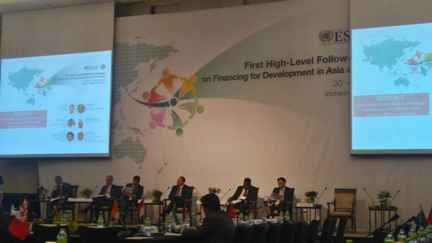 “The Proposal [of Asia-Pacific Tax Forum] should create a notion that raising of revenues should be accompanied by transparent and participatory budget processes; on the other hand the spending policy should aim for poverty reduction, environmental sustainability and ensure provisions for social services and social protection,” said Titi Soentoro of Aksi! for Gender, Social and Ecological Justice – Indonesia. In response to these issues, CSOs call on the substantial inclusion of CSOs and local communities in the decision-making, implementation, assessment & monitoring phases of infrastructure projects to make sure that people’s voices will be heard. Social and environmental safeguards to protect the environment and communities affected by development projects should be put in place. CSOs stressed the importance of country and democratic ownership, mutual accountability and transparency, and CSO engagement in development cooperation.